No doubt about it--a movie about people gluing liquid-filled glowsticks onto cows' asses sounds farcical and, frankly, really stupid. 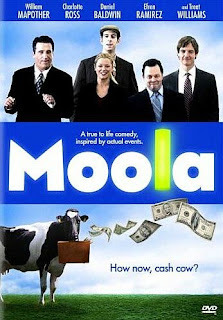 But surprisingly, MOOLA (2007) is neither. In fact, the glowsticks-on-cows-asses thing not only makes sense, but it actually happened in real life. Who the heck would make up something like that? Steve (William Mapother, WORLD TRADE CENTER, THE GRUDGE) is part-owner of a failing glowstick company who sees dollar signs when some dairy farmers come up with a new use for his product that could revolutionize dairy farming. I'm not going to describe it--you'll just have to find out for yourself. So things are finally looking up for Steve and his partner Harry (Daniel Baldwin), and it's about time, too, since they're both having really bad financial and marital problems. But in order to cash in, they have to strike a deal with an exceptionally sleazy corporate shark named J.T. Montgomery (Douglas Hutchison) who you just know is gonna screw 'em over big time. I had a bad feeling about this movie thanks to its punny title (MOO-LA, get it?) and wince-inducing tagline ("How now, cash cow? "), but this began to dissipate as soon as I found out that it's really a genial, rather heartfelt story that doesn't try too hard to be laugh-out-loud funny and is sufficiently grounded in reality that you can actually care about the characters as real people. Steve and his estranged wife Nora (Charlotte Ross) have realistic problems and so do Harry and Louise (Annabelle Gurwitch, "Dinner and a Movie", DADDY DAY CARE), although the latter couple's antics are played more for laughs. And their high-level business dealings with crooked dairy industry mogul J.T., in which they're woefully out of their league, generate real suspense. William Mapother, funny and endearing as Steve, heads a terrific cast. I've liked Daniel Baldwin ever since he played a cop on "Homicide: Life on the Streets", and comedy-wise, he's settled into that cuddly, Fred Flintstone thing that seems to affect all Baldwin brothers sooner or later. Curtis Armstrong of REVENGE OF THE NERDS and "Moonlighting" is on hand as Steve and Harry's semi-inept legal consultant, and the gorgeous Charlotte Ross, who used to be a regular on "NYPD Blue" although I remember her most fondly from the "Teacher Pets" episode of "Married With Children", is convincing as someone Steve would desperately yearn to get back together with. Treat Williams also turns up in a couple of scenes to give the film a little added star power. The standout, however, is Douglas Hutchison as J.T. He's such an effective actor that I actually savor his performances, whether he's playing one of "The X-Files"' most memorable villains, Eugene Tooms, or the palpably vile Percy Wetmore in THE GREEN MILE. This may be a comedy, but Hutchison gives us a character that is no less effective for that. His Percy Wetmore-like J.T. is wonderfully greedy, slimy, conceited, self-centered, and petty--a genuinely formidable nemesis for our hapless heroes--and adds a whole extra dimension to the film. The 1:85:1 widescreen image and Dolby 5.1 sound are just fine for a movie like this. I mean, we're not talking LAWRENCE OF ARABIA here. Extras include a brief promotional featurette, about ten minutes of deleted scenes, and trailers for this and other Allumination Filmworks releases. The opening titles themselves are a lot of fun, with a series of "Far Side"-type animated cow cartoons by Leigh Rubin of the Illusion Factory.